I believe this article will be especially interesting for those who already have car or just want to buy a new one.It is a well-known fact that you are forbidden to use mobile phone while driving. And that’s why a lot of drivers don’t even know that mobile apps can be very helpful. At any stage of car-ownership and in any situations you may get into while driving. I suggest you the best apps for iPhone for any case. Car choosing With Who’s Faster App When you search for a car, you have to variants to follow: surf the Net reading different specs, reviews, comparisons, or just to load a Who’s Faster App and to do everything for 15 minutes. 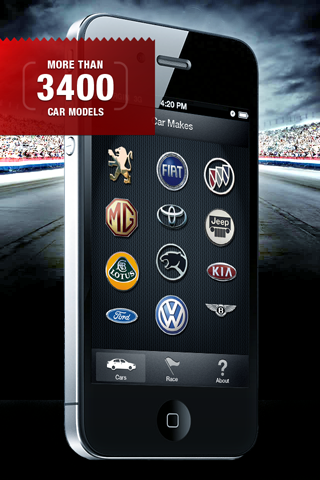 This application can be called an encyclopedia of cars. There are descriptions of more than 3,400 car from all possible car-makers. Besides, there is a unique built-in simulator of car racing where you may compare different cars. The application will tell you the cost of the car you have chosen. You will get an opportunity to search among new and used cars. Lots of expert reviews will be a great bonus for your research. Start taking care of your car since the very first day using this mobile application that proved different services, including fuel tracking, maintenance reminder, logging repair. By the way, the application will be useful for motorcycles owners as well. Your car won’t work without good gas. But I believe everyone want to optimize the expenses on the fuel. And GasBuddy will do it for you. What can it do? I mostly compare the nearest gas stations and prices there. Do you want to use your fuel wisely and to know exactly where it goes? Install the app and you will find it out. Sometimes the traffic is unpredictable. The jams may happen in every unexpected places. Get the latest reports about accidents, traps, traffic situation in real time. Taking into account the app should be used while driving there is a voice-guided navigation system for you to drive safely. Do you have any urgency mail to send? Or you need to answer a very important message? The application uses text-to-speech and speech-to-text technology for you to be able to do it while driving. Text'n Drive Pro can be synced with Gmail, Hotmail, Me, Yahoo and other most used mail services. Got lost? Or can’t find the right direction? Today it is a piece of cake to do it using your smartphone. The MotionX GPS Drive will show your location and will navigate you to the right point. Of course, it can be controlled by your voice. It has such services as local search, multi-stop routing and Wikipedia integration. Let’s hope that you will never need this application but everything may happen. The application allows you to document all the details of the accident by making photos and by making a detailed report in PDF format. This report can be sent to your insurance company. It also can call 911 or any other numbers that are set on speed dial in emergency cases. No matter if you get into the accident or not, sooner or later you will have to do repairs of your car. To make your life easier and to make unbiased repair estimate, to find the best and the nearest mechanic, to track the repair process, just load the app and install it for free. Well, here it is. I believe I have provided the most important situations where mobile application can be a great assistant to you, a driver. Do you know any other?